My dad has given my blog some attention on his personal blog a few times, so I just wanted to take a moment to brag on something cool he does. 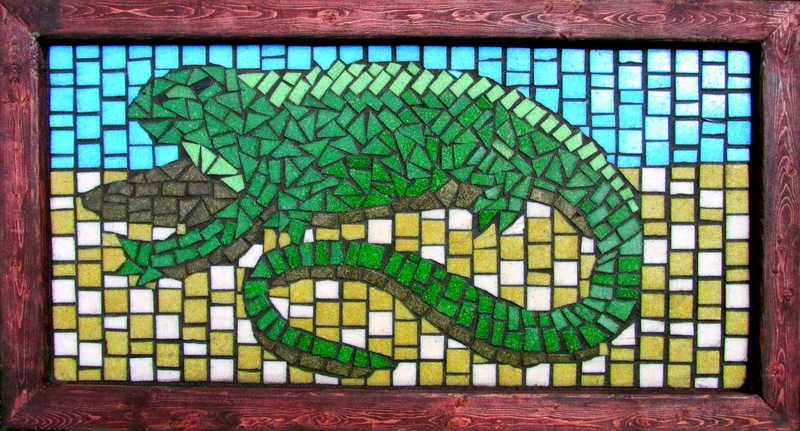 My dad's name is Jack Mast, and he makes some really cool mosaics. Really, check out his mosaic blog. Look especially for the "barbecued iguana" and sunset beach ones. They're awesome. We've got a huge one hanging on the wall at home, and he used real seashells in it. Sometimes his mosaic hobby completely takes over the dining room table, but it could be worse. I mean, he used to make tie-dye t-shirts, and while nobody can deny that tie-dye t-shirts are fun, I kind of have half a drawer full of tie-dye shirts that I don't know what to do with. Now, mosaics don't have to be stored in dressers or closets. You can just hang them up on the wall, and they'll sit there and shine awesomeness down on you. And they look really cool. So definitely check out his blog. He's got all kinds of pictures of the mosaics he's done and the process he uses to make them. I love you, Dad! Also, I'm sorry I teased your tie-dye hobby.